For BBC data and photojournalist Marc Ellison, the visual stimulation of a comic book can tap into an image of life. That’s why he is using graphic novels, an unorthodox medium in hard news, to convey his stories. Ellison believes there is more risk than reward with parachute journalism. Reporters are thrust into an area with little to no knowledge in order to cover breaking news, file their stories quickly and leave within a matter of hours or days. Critics believe this type of reportage challenges the notion of "groundtruth" —putting boots on the ground to document a story in-depth and embedding yourself in a region for longer periods of time. During a presentation at Humber College on Sept. 22, Ellison spoke about his experience in Uganda covering the stories of women who were abducted by the Lord’s Resistance Army, a rebel group in central Africa. Ellison previewed the story of 14-year-old Jacinta Acan, one of the girls captured by the LRA, and her experience will be portrayed in his interactive graphic novel using a mix of video, illustrations and text. Even though there will always be skeptics, Ellison said comic book journalism is increasingly being considered an alternative to traditional journalism because superheroes are easier to relate with. Ellison grew up with Christopher Reeve as Superman, and much like the character, he put himself in harm’s way while reporting. After receiving a $25,000 Fellowship for International Development Reporting, granted by the Aga Khan Foundation Canada and the Canadian Association of Journalists, Ellison will travel to Tanzania in December to report on the plight of child marriage. 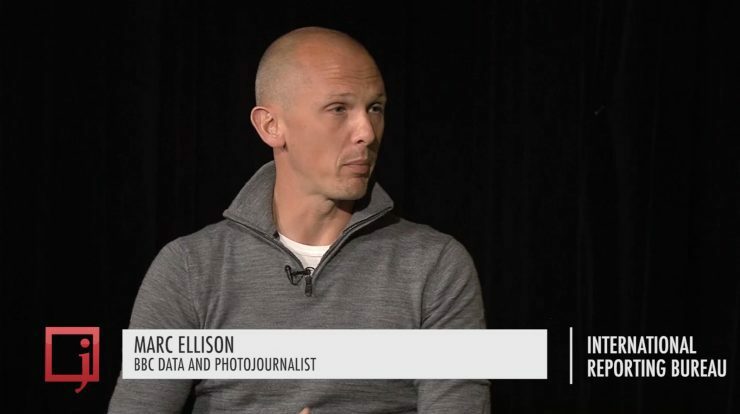 J-Source IRB’s Christina Romualdo sat down with Ellison to discuss his next graphic novel project, the dangers of parachute journalism and how he plans his trips overseas.